Select and start Programs - Flash Magic - Flash Magic. For Communications, select the PC port with the serial cable connected from the board as the COM Port, specify 9600 as the Baud Rate, and select the P89LPC935 as the Device. 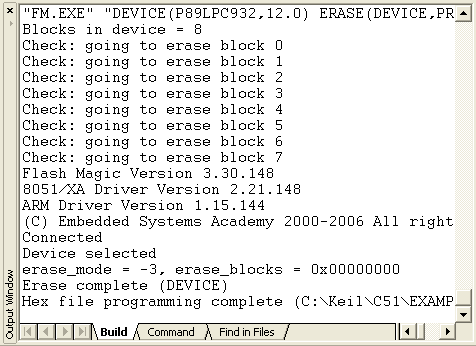 Enable Erase blocks used by Hex File. Select the Hex File, for example: root\C51\EXAMPLES\PHILIPS LPC935\BLINKY\BLINKY.HEX. Open the dialog Options — Advanced Options —Hardware Config. 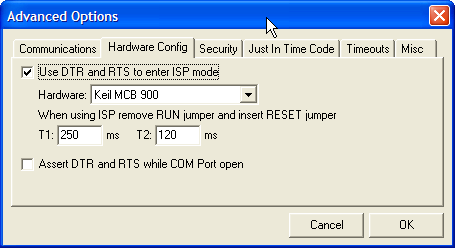 Enable Use DTR and RTS to enter ISP mode and disable Assert DTR and RTS while COM Port open. Also, make sure the Hardware: text box has Keil MCB 900 selected, then click OK.
Click Start to download the Hex File into the Flash ROM of the P89LPC935. In case of errors, check the COM connection and jumper settings (RESET: ON, RUN: OFF). µVision uses Flash Magic in batch mode for Flash programming. Monitor the progress in the Output Window that displays the messages Flash Magic generates.